I don't think that Chili is technically a soup but this one sure does make it on my list. 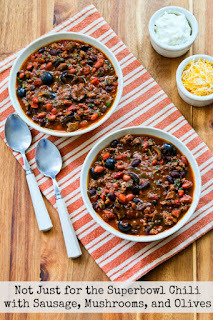 How can you go wrong with Sausage, Mushrooms and Olives added to your Chili? Stop by Kalyn's Kitchen by clicking on the photo above and make a pot of this today!